+ Ruby B. Morse Culpepper, 7 Mar 1892 - 7 Mar 1941. W. B. Culpepper Jr., d. 5 Oct 1919 in Brooks Co., GA.
Ruby Culpepper, Wife, F, 28, M, GA/PA/GA. Ruby Blanche Culpepper, Dade Co., FL, Female, White, Vol 1344, Cert 4989, died 1949. 1. Laura V. CULPEPPER was born in September 1854 in AR. Laura V. CULPEPPER and Robert A. MARTIN were married on July 26, 1877 at Newton Co., MO. Robert A. MARTIN (son of William MARTIN and Isabella) was born in July 1845 in OH. i.Roy MARTIN was born in 1878 in Jasper Co., MO. ii.Robert V. MARTIN was born in February 1883 in Jasper Co., MO. 2 iii.Marion M. MARTIN, born on December 14, 1884, KS; married GRETT; married Frederick S. ALDEN, in 1925, CA; died on October 2, 1969, Riverside Co., CA. iv.Josephine MARTIN was born in June 1889 in Jasper Co., MO. 2. Marion M. MARTIN (Laura V. CULPEPPER-1) was born on December 14, 1884 in KS. She died on October 2, 1969 in Riverside Co., CA. In the Calif. death records, Marion's mother's maiden name was spelled Culpeper. 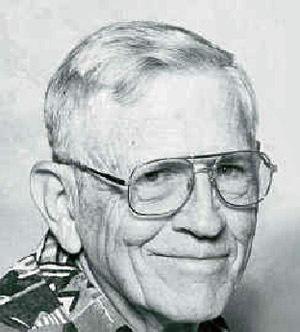 i.Robert W. GRETT was born on December 29, 1914 in Corona, Riverside Co., CA. He died on March 19, 1939 in Riverside Co., CA. Mattie Boydston, 5, F, TX. E-mail written Mar 2007 to Warren Culpepper from Charles Richard Johnson e-mail, 155 Hazelnut Dr., Fernley, NV 89408, Phone 775-575-5895, e-mail address. Biography* � MISS JOSIE CULPEPPER, dealer in groceries and queensware, was born in Missouri February 10, 1859. She was educated in the high school and taught school in Missouri five years. She came to Kansas in 1882, locating in Cherokee and opened the above business in May of that year. Miss Culpepper owns an interest in two farms in Missouri and one in Arkansas. Jossie Culpepper, Other, F, S, W, 21, MO/VA/IL, School Teacher. From Evelyn Delgado, uc1delgado@ix.netcom.com, May 2000: "No one has identified the older woman in the front, but I believe that is Sarah Jane. The idea put forward now is that Sarah Jane's surname was Stinnett and her mother was Mary Cox. This is a new development for me; a real surprise, so I'll have to work through this to see how I am related to her. The man standing behind her is Ephraim (Eph) Culpepper, her son. One of the men standing next to Eph is William B. (W.B.) Boydstun. I believe it is the fellow in the checked suit. Could the other person be H.T. Boydstun? The woman sitting next to Sarah Jane in the striped dress is my great-grandmother Harriet Isabelle (Belle) Shuster Cox. She is married to John David (J.D.) 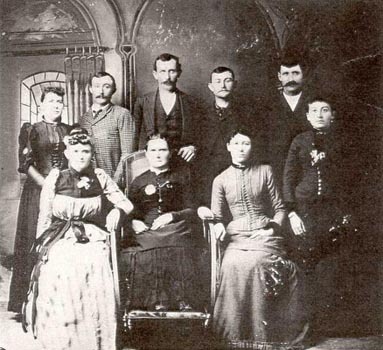 Cox who is standing on the far right. The woman in the front row with all the buttons down the front of her dress is Ora Culpepper, Eph's wife. I don't know who the woman is who is standing in front of J.D.. Actually she looks a lot like his daughter (my grandmother) turned out to be as an adult woman. One woman might be W.B. 's wife and the other woman might be his sister Amy. I believe this picture was taken about 1885 when John married Belle. I have another picture of them together wearing the same clothing. I had wondered if it were a wedding picture. If so, this was taken in MO. Sarah Jane would have been about 50 years old. Lease Option 1912 Book 3, p. 399 (I noted a number 3. I don't recall why. …….Estate 1926 P. 73, book 4, wife Ora L.
Mary F. Goul and E. L. Goul, married couple from Mosquite, Malheur Co., Oregon. $600 received from Ephraim Culpepper, of the same place quit claim in estate of H. T. Boydstun, of Roseberry, Boise Co. Idaho, pending settlement on final distribution any shares held by them. 3 March 1905. Filed at the request of Ephraim Culpepper 6, March 1905. Mattie Knox, Weir City, State of Kansas, daughter of H. T. Boydstun 21 Dec 1904 received from E. Culpepper, County of Malheur, state of Oregon, quit claim $300, 23 Feb 1905 . Husband, Thomas Knox, Cherokee County, Kansas. Ephram Culpepper, Other, M, S, W, 18, MO/MO/MO, Servant Farm Laborer. E-mail written 2000 to Lew Griffin from Evelyn Delgado (grandaughter of Edna Cox Dixon), e-mail address. Dr. Wesley W. Craig, Early Pioneers and Settlers of Valley Co., ID, Rootsweb, 1997. Ephraim Culpepper, Head, M, Wh, 48, md1-3yrs, MO/VA/OH, Speculator/Burned Personal Property? Bell Leffingwell, Mother-in-law, F, Wh, 65, wid, ch 2/2, TX/MO/MO. 1st I am from the Bartlett Boudstun line. Margaret Anna Boydstun, Howell's sister. I hate loose ends, so have been trying to find out about Ephraim Culpepper. I stumbled across the Illinois State Archives site where they have posted all there marriages(or most of them) & there was Ephraim Culpepper & Sarah J. Stennett md june 29 1851 Schuyller Co Illinois. Also a William Stennett, who md a Mary Cox Dec 25 1834 Schuyller. I am working on finding William & Mary in 1850 to see if I can prove they are the parents of Sarah. 1850 census of Schuyller is not in good condition & so far no luck. Molly C. Pettit, Sister-in-Law, F, 18, S, LA LA LA. Birdie P. Culpepper, Wife, F, 49, M, md@22, LA/LA/LA, Not employed. E. L. Culpepper, 23 Jun 1941, 68 Years, Ouachita Parish, LA. 26 Aug 1931, Page 2A. Obituary of Mrs. L. C. Wren of Wrens, GA, who died 25 Aug 1931 in Wrens, GA. Her survivors included a daughter, Mrs. C. C. Culpepper of Wrens, a son Carlton Wren of Atlanta, and a grandchild Wren Culpepper. Marther E. Wren, died 25 Aug 1931 in Jefferson Co., GA.
Elsie D. Culpepper, Wife, F, 24, M, md @ 19, GA/GA/GA. E-mail written 1999-2013 to Culpepper Connections from Gail Lynne Culpepper Webster (#10908), Georgia, e-mail address (Feb 2013). Luther C. Wren, died 29 Mar 1951 at 74 years in Jefferson Co., GA; Residence: Jefferson Co., GA.
Elsie W. Culpepper, d. 21 Apr 1995 at 89 years in Richmond Co., GA; Res. in Banks Co., GA.
22 Apr 1995, Page 19A. Obituary. Mrs. Elsie W. Culpepper, 89, of Augusta, died 21 Apr 1995 at St. Joseph Hospital.Interment at Hillcrest Memorial Park, 23 Apr 1995. She was retired from the State Employment Office. Survivors include a son, C. Wren Culpepper of Augusta; a daughter, Martha Jean Culpepper of Augusta; grandchildren, etc. Obituary of Charles Wren Culpepper (#10907), published December 14, 2011. Obituary* 14 Dec 2011� AUGUSTA, Ga. - Mr. Charles Wren Culpepper, 81, beloved husband of 53 years to the late Mrs. Phyllis Easterwood Culpepper, entered into rest on Monday, December 12, 2011 at Select Specialty of Augusta. A native of Wrens, GA., Mr. Culpepper was a member of Cokesbury United Methodist Church and retired from AT&T as a Switchman. He was a longtime member of Green Meadows County Club, where he served on the Board for many years. He was preceded in death by his father, Clarence Culpepper, and mother, Elsie Wren Culpepper. Mr. Culpepper is survived by his son, Chuck Culpepper (Rhonda); his daughter, Gail Webster (Lee); a sister, Jean Culpepper and his grandchildren, Chase Beazley, Whitney Webster, Beau Webster, Hannah Culpepper, and Holley Phillips (Steve); and his great grandchildren, Jackson Beazley, Drew Phillips and Ali Phillips. Funeral services will be held at 3:00 PM on Friday, December 16, 2011 at Cokesbury United Methodist Church with the Rev. Sandy Heslop officiating. Mr. Culpepper will lie in state at the church from 2:00 PM until service time. The committal service will follow in Hillcrest Memorial Park. Obituary of Phyllis Easterwood Culpepper (#61497), published 1 Jul 2010. 23 Apr 1995, Page 1C. Funeral Notice. In additon to above, also identifiedthat she was the widow of Charlie Clarence Culpepper and had as survivors, one grandson, Chuck Culpepper of North Augusta, SC, and one granddaughter, Gail C. Webster of Vidalia, GA.
E-mail written 14 May 2010 to Warren L. Culpepper from Hannah Culpepper (#61423), e-mail address. 26 Sep 1991, Page 5C. Birth Announcement. Whitney Leighanne Webster, born 28 Aug 1991, d/o M/M Lee Webster. Mrs. Webster is the former Gail Culpepper, d/o M/M Wren Culpepper. George Harlin Culpepper Jr., M.D. George Harlin Culpepper, Volusia Co., FL, White, 31 Aug 1901 - 31 Oct 1972. Stewart P. Culpepper, Son, M, 2 8/12, S, GA/GA/GA. Obituary of Stuart Pitner Culpepper (#10915), published 27 May 2009. George H Culpepper and Cecil Culpepper divorced in 1952 in Brevard Co., Florida. E-mail written 1 Sep 2011 to Warren Culpepper from Brian A. Banks (s/o #47469), e-mail address. Obituary* 27 May 2009� Stuart P. Culpepper, 81, passed away May 21, 2009, after a long journey of Alzheimers. He was born in Buchanan, Georgia, August 6, 1927. Stuart retired from Winter Park Memorial Hospital, Winter Park, FL 1991 after 31 years as an Anesthesiologist. He had a Family Practice for 7 years before becoming an Anesthesiologist. Doc "C" loved motorcycle riding, golfing, and woodworking. Dorothy Stone Culpepper, Cert 10437, Seminole Co., FL, White, 4 Sep 1930 - 23 Jan 1984. Cecil Brittan Culpepper, Cert 90840, Seminole Co., FL, White, 12 Jun 1903 - 30 Jul 1990. E-mail written 2006-2008 to Warren Culpepper from Douglas Scot Culpepper (#54555), e-mail address. Source: http://www.avvo.com (20 Jan 2010). E-mail written 1999-2009 to Culpepper Connections from Philip Edward Culpepper (#10917), Anne Arundel Co., Maryland, e-mail address.